No matter the reason, if you want to do something new and fun then Paint Along Studios is the place for you. Becoming an artist for the night has never been so much fun. Absolutely NO EXPERIENCE needed and we mean no experience needed. Our award winning artist will walk you through every step. Paint Along with our award winning artist as you receive step-by-step instructions. Our Liquid acrylic medium makes any mistake a worry free experience. So let loose and relax. You will surprise yourself with all the fun you will have as you uncover a hidden talent. ALL ART MATERIALS are provided for you with your purchase so just bring yourself and be ready to have a great time. Make your bridal shower, bachelorette party, birthday party, girls night out, team builder, or office party a success with Paint Along Studios. 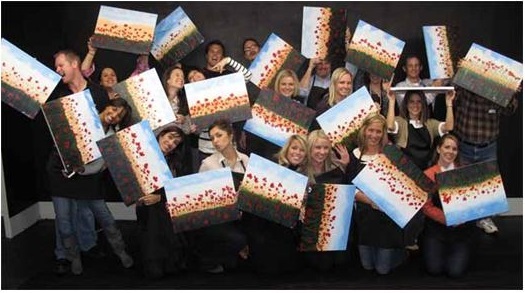 Paint Along Studios currently offers two types of Adult Parties: Regular and Express options. This will give you the most flexibility regardless of your group size and budget. Paint Along Studios would also love to host your Child’s next Birthday party. Make the birthday planning easier and let us take care of your child’s next birthday as part of our birthday package. These benefits are exclusive to private events held at Paint Along Studios. Regular class benefits are different. All Art Supplies are provide with your purchase including Artist for your event.